A brutal storm rolled through Cape Cod yesterday. Winds of 68 mph were reported in Harwich, and there were power outages in Bourne and Falmouth. We got a 45 mph gust on my wind gauge in Buzzards Bay. A man in Orleans was injured by falling glass from a second story window at Stop n Shop. He didn't get killed or anything, but I bet it was ugly. A girl was also blown into the water in Provincetown (scroll down for that story). We got about 2 inches of rain, and the village of Buzzards Bay turned to snow after dark. We picked up a very pretty coating, and all the yucky brown snow is white again. 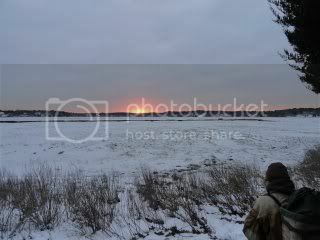 The picture of the sun is the The Great Salt Marsh in Duxbury. More weather fun is upcoming. We have a pair of systems coming through. Very late tonight, snow should start to fall. It will continue for a while Sunday, and we could get 1-3" of snow. Following on her heels is another storm for Monday, but this will just be another inch of rain. We'll sneak back closer to the snowfall and put a radar shot up. Most of today should be sunny, though. Enjoy!